HONG KONG--(Marketwired - Jun 4, 2013) - SMART Expo, organiser of regional-renowned overseas property and investment expositions, announced today the 31st SMART Investment and International Property Expo 2013 will be restaged on June 8-9, 2013 from 11am-7pm in Hong Kong Convention and Exhibition Centre. The largest of its kind in Asia, SMART Investment and International Property Expo composes a variety of investment talks, overseas property showcases and activities onsite for visitors. Admission is free. Every attendee will enjoy a mystery welcome gift and get a chance to win loads of irresistible lucky draw prizes which includes Bangkok Golf Trip for Two, iPad Mini, Hyundai Cute X Android Tablet, Samsung Galaxy, and many more. The 31st SMART Investment and International Property Expo will feature a wide variety of affordable luxurious overseas property development projects from Australia, UK, Malaysia, Thailand, Philippines, Japan, Cape Verde, Dubai, Brazil, Canada and US. Mr. Hoi CHEUNG, Managing Director of SMART Expo said, "There are smart choices available in the market other than local property and stock market. To many people's surprise, quality properties from overseas markets are actually affordable. Attractive returns on investment, high-yields and low price entry points are the many interesting propositions from England, Thailand, Canada, Malaysia, Australia, Japan, Philippines and many more including US, Brazil, Cape Verde and Dubai. In the Expo, you can find a wide range of portfolio to choose from including inner-city condos, oceanfront villas, retirement homes and student accommodation presented by leading global property developers." Hoi continues, "There has definitely been a pick-up in buyer interest in overseas properties in recent months. Our exhibitors receive inquiries for international residential properties have been up by 10-15 % since the government announced its latest control measures on the market in February." "This year, we gained continuous support from our overseas exhibitors to join the 31st SMART Investment and International Property Expo 2013, including new exhibitors from Japan, MARIMO and Y & T Development. Also, we provide a one-stop-for-all investment networking platform at our Show to feature a variety of alternative investment choices, including Asia Plantation Capital and Capital Alternatives, participants for their first time, to showcase some highly-selected projects regarding Sustainable Responsible Investment at the Expo. Other alternative investment area includes energy investment Breitling Energy, art investment Futures Group, as well as Collins & Kent Fine Art Investment," concluded Hoi. Investment properties in Australia for just HK$250K up. UK Property from HK$650K with guaranteed 8% rental yields per annum. Freehold apartments in Koh Samui and Pattaya, Thailand for HK$360K. Fully-furnished suites on prime freehold land in Kuala Lumpur for just HK$1.5M up. Luxury condos and ski villas in Tokyo and Hokkaido, Japan starting at HK$1.3M. This year the SMART Expo launches an inaugural Million Dollar Forum to be held on June 8 and 9 at HKCEC. This includes a powerful line-up of the renowned moderator, Elsa Pau and 7 panel speakers who are the local experts of their respective area. The Forum would be in a lively debate format to give insights for our visitors where to park 5 million dollar cash smartly. Moderator: Elsa Pau, Founder, Publisher and CEO of WealthAsia Group. Named by AsiaWeek as one of Asia's Most Influential Women, Elsa is a finance industry veteran, Editor-in-Chief of BENCHMARK Magazine and Senior Partner at Estate Solutions Group, an estate planning consultancy for high net worth individuals. Panel Speakers: Eddy Wong, General Manager of Fundsupermart.com; Dominic Chung, Executive Director of CBRE, Investment Properties, CBRE; Chow Chee, Associate Director of Shenyin Wanguo Securities (HK) Ltd. & Consultant of Prosticks; YT Kum, Consultant of Morningstar Asia; Bruno Lee Regional Head of Retail for Asia Pacific ex Japan, Fidelity Worldwide Investment; Jackie Choy ETF Strategist, Morningstar Asia; as well as Judy Chai, CEO & Co-founder, Infiniti Pacific Properties Ltd.
Top 5 global cities to invest and how to own and buy properties overseas leverage on current immigration & tax benefits. How to maximize returns from alternative investment products such as energy, art and wine. Visitors of SMART Expo can now get into swing at HKCEC via the virtual golf simulator, sponsored by Golf EZY. All golf-lovers are welcome. An advanced simulator of its type with the a comprehensive golf training programme, the golf simulator machine has beautifully landscaped courses each with it's own driving range. The computer is extremely accurate in terms of distance, club head speed, shape of shot and ball roll. Players see everything happening on the course in real time. Join the Closest Shot to the Pin Contest at SMART Expo on June 8-9 at HKCEC. You give it your best shot via the Golf Simulator to win grand prize Bangkok Golf Grip for Two. Prizes for best top 10 shots include free golf lessons by Kim Inglis, an experienced coach and Managing Director of Golf Ezy. 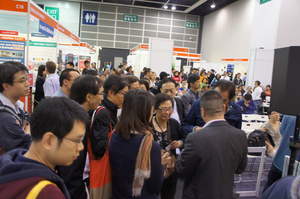 SMART Expo is open to all. Free admission. Pre-register to get a chance to win an iPAD Mini. For more information, please goes to http://www.smartexpos.com or call 2944 6430. Over 20 expert-led seminars on tips for first-time overseas property buyers, top 5 cities to invest, alternative investment talks on art, wine and energy, Fengshui investment viewpoints, etc..
SMART Expos - Asia's leading international property expo since 2004!